Welcome to the Supermercado Sandy Spectacular, Round One, Part Two, wherein I review Albertsons’ unwitting entry in this poorly organized but well-intentioned contest. The wrap costs $2.99. You can also purchase the lunch box, as I did, for a dollar more. The lunch box includes the wrap as well as a 1-ounce bag of Nacho Cheese Doritos and a 2-ounce Aunt Katie’s Chocolate Chunk Cookie. Primary ingredients: Turkey breast, cabbage, cheddar cheese, feta dressing (mayo and feta cheese, basically) and bacon. If there’s one thing I’ve learned over the course of my sandyblog editorial tenure, it’s that meat often isn’t just meat. Let me explain. Previously, when eating a meated sandwich, I would have assumed the only ingredient in the meat is meat. E.g., the ingredients in ham would be as follows: ham. But that’s not the case. The turkey breast in this wrap contained, among many other things, turkey broth, dextrose and carrageenan. What happens after the turkeysmith carves the breast meat off of a cooked turkey? Does he (or she — ladies can be turkeysmiths, too) inject it with all these sub-ingredients? Does he brush them on? Does he toss it all into an industrial mixer then apply an artificial rind to simulate the look of normal cooked and sliced turkey breast? These questions haunt me (not in a scary way, but in an annoying Casper kind of way). The wrap tastes so much like cheese and mayonnaise that I barely noticed the turkey and bacon. As for the cabbage ... well, I saw it in there, but wouldn’t have noticed it in a blind taste test. Possibly taking a cue from Subway, Albertsons’ deli staff went balls out with the mayo, thoroughly covering every interior surface with the feta dressing. A single bite was enough to coat the inside of my mouth with mayonnaise, which displeased me. Sinfully decadent is a phrase usually reserved for desert marketing, but I think it’s an apt description here. A person who would put mayo on a quesadilla would like this wrap. And that’s the brilliance of this sandwich. During the anti-carb era, wraps were hailed as Dr. Atkins’ miracle solution to the Sandwich Quandary: “How can I cut carbs while still enjoying sandwiches?” His answer was the wrap; tortillas have fewer carbs than bread, supposedly making wraps a healthier alternative to sandies. That mentality has endured into these more carb-friendly times. Thanks to the evil marketers controlling America, Albertsons can present a huge pile of cheese and mayo and bacon and cram it into a tortilla, and gullible consumers will eat it, thinking to themselves “I’m making a healthy choice.” Although nutritional info was inexplicably missing from the wrap and lunch box’s packaging, I am quite confident your cardiologist would jab you in the eye with a sharp cardiologist’s implement if you told her you’d eaten one of these. Carbohydrates aside, I kind of liked this sandwich. I certainly liked it more than King Soopers’ cranberry cream cheese abomination. I recommend upgrading to the lunch box. It’s a good deal for a buck. The Nacho Cheese Doritos compliment the wrap perfectly and the cookie, although unremarkable, offered some unintentional laughs. 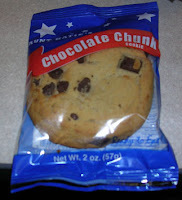 First was its patriotic wrapper, which seemed to imply that eating the cookie somehow counts as an display of national pride. Even funnier was the wrapper’s declaration on both its front and back that the cookie is “Ready to Eat!” “What exciting news!” I thought, sarcastically. Are there bakers out there selling cookies that require assembly? Is anyone selling single-serving discs of uncooked cookie dough? I mean, really Aunt Katie, think about it! 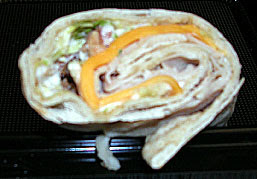 I could see Albertsons’ Round One entry taking third in many Supermercado Sandy Spectaculars, but in light of the soft competition, the Turkey Bacon Cheddar Wrap slid into second place, leaving a streak of mayo in its wake.